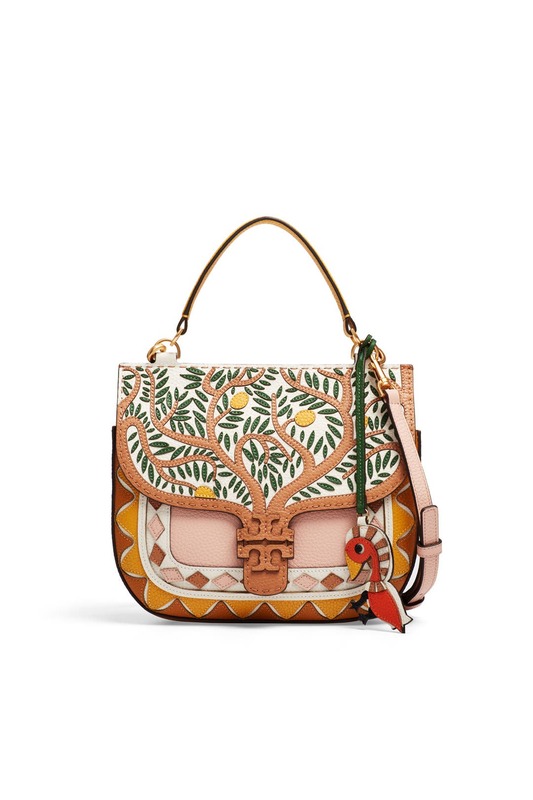 A tropical take on a signature style, this Tory Burch satchel is just right for the season. 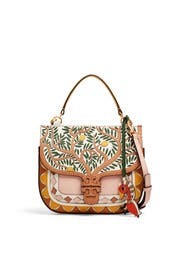 Pink pebbled leather satchel with Tory log and patchwork stitched detailing. Top zipper closure, 1 interior zipper pocket, and 1 slit pocket. Top handle has a 4.58" drop and shoulder strap has a 16.7" drop. 6.8"H x 10.2"L x 5.4"D.
It's a little smaller than I expected. Still fits my phone and my stuff. It does come with a detachable shoulder strap. I personally like to carry it by the handle. The little bird on the dangler couldn't be any cuter! Love! I have really enjoyed carrying this purse. It is eye-catching, and you can certainly tell it is well made. 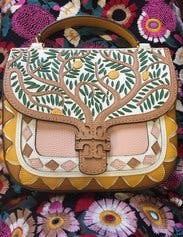 The lemon tree embroidery and placed leather pieces on the front are to-die-for! I originally rented this for vacation, but I have been using it everyday. It is putting me in the getaway mindset, but it is actually very versatile. I have included two photos one of the front, and one of the back. The light pink patch pocket on the white background for the back is really useful. 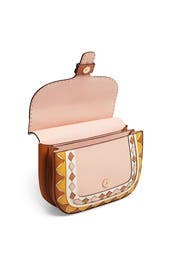 I can place my phone in there without having to open the purse. But if you do have to open it, it is easy to do. I also like the way it easily stays upright when you place it on a level surface. This bag is incredibly beautiful in person. The colors and details are exquisite. It holds the essentials: wallet, keys, phone, and makeup. The crossbody strap worked nicely; it looked even better with the short carry strap. 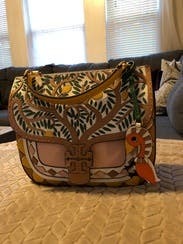 Beautiful purse for spring/summer or vacation.